The Indian start-up entrepreneurs dream has become much bigger and ambitious. The territorial jurisdictions don’t count and the compliances are but boring. 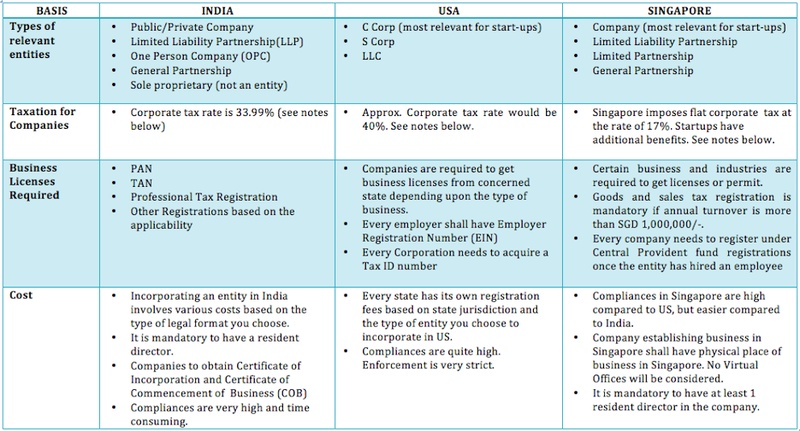 If the entrepreneurs are looking at doing business in US and Singapore and want to know how the compliances stack-up to India, here is a bird’s view. These countries are beneficial both in terms of ease of doing business and tax regimes. India is still a winner when it comes to large untapped markets. A little about taxes. Please check with your CA /CPA for the rate applicable to your business. Rates and applicability are dependent on the facts of the case. USA : The corporate income tax rate is approximately 40%. The marginal federal corporate income tax rate on the highest income bracket of corporations (currently above USD 18,333,333) is 35%. State and local governments may also impose income taxes ranging from 0% to 12%, the top marginal rates averaging approximately 7.5%. A corporation may deduct its state and local income tax expense when computing its federal taxable income, generally resulting in a net effective rate of approximately 40%. The effective rate may vary significantly depending on the locality in which a corporation conducts business. The United States also has a parallel alternative minimum tax (AMT) system, which is generally characterized by a lower tax rate (20%) but a broader tax base. Singapore : The corporate tax rate is 17%. From the Year of Assessment (YA) 2013 to 2015, companies will receive a 30% corporate income tax rebate capped at SGD30,000 per YA. There is a partial exemption of 75% on the first SGD10,000 and 50% on the next SGD290,000 of the company’s income. Start-up tax exemption can be granted on the regular income of a qualifying company on its first SGD100,000, and a further 50% exemption is given on the next SGD200,000, for each of its first three consecutive years of assessment. A concessionary tax rate of 10% or lower applies to qualified entities. Anu Kapoor and Pooja Shah handle company structuring in India, US and Singapore along with compliances. Disclaimer: This is generic information only. Please speak with your attorney before taking any specific action. This entry was posted in Articles and tagged Business in India, Business in Singapore, Business in USA, Expanding Business Abroad on July 25, 2014 by novojuris.